I watched the entire 8-episode series of The OA in one weekend, during a time when I was exhausted and premenstrual. I was tired in the physical sense, and also tired in the sense that I was bored with the way things had been going in my life and work. I was seeking something, but wasn’t quite sure what it was. I watched the bulk of the show in one 6-hour sitting with a friend where I repeatedly screamed out in excitement, awe, fear, and a whole bunch of other emotions that flowed through me. As the episodes progressed, it became clear that these characters who were held captive were discovering the power they had through their BODIES to heal and transform a terrible situation. Since that is EVERYTHING to me, I was pulled in even deeper and felt lit up from within even more. And that’s how the Netflix series The OA started to become a reality for me. Not to be dramatic (but ok this might sound dramatic), it felt like a calling. Me, Eduardo, Ashley, and Jenny: scouting out the flashmob location. If we were going to turn these powerful movements into a large-scale flashmob, it was going to be outside of a Trump building, with the intention to spread a healing, transformative energy and to get people in our country out of a bad situation with this new presidency and into a “new dimension” - similar to how the movements were used in the show. Magic has continued to unfold since as the three of us - Ashley, Eduardo, and I - decided to make this flashmob happen. bringing people together through dance and movement, for the purpose of greater healing and transformation. My Monday night dance class in NYC has been HOPPING with people seemingly coming out of nowhere to dance it out and dance with the OA movements. We also heard from Wes Veldink, an amazing choreographer, and Ryan Heffington’s Associate Choreographer for The OA. Wes assisted Ryan, along with Denna Thomsen and Ryan Spencer, in the creation of the Five Movements and he worked directly with the actors from the show to teach them the Movement choreography. Wes will personally be at our flashmob rehearsals, helping to ensure we maintain the integrity of the movements. He is awesome and I’m soooooo excited!!! I’ll be posting video and recaps of the flashmob experience next week, so stay tuned. And until then, I share all of this excitement with you because it illustrates something I’ve been saying for years…. When you listen to your body and trust in the cycles of creativity, amazing opportunities emerge organically. I truly believe that if I hadn’t succumbed to my PMS exhaustion and spent 8 hours of my weekend watching Netflix a month ago, I wouldn’t be in such an exciting creative flow right now. In my experience, forcing things to happen usually leads to burnout and frustration, whereas surrendering to the downtime and inviting the pause naturally allows things to happen in their right time. Try it out for yourself, and please let me know how it goes. Brit Marling & Zal Batmanglij, the creators and executive producers of The OA, for starting such a powerful movement with your ideas. 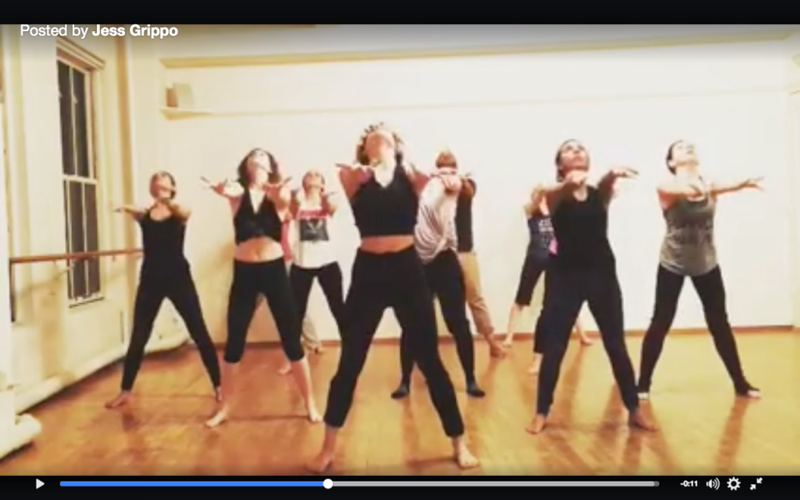 Ryan Heffington, the Choreographer of the Five Movements, for your gracious generosity and blessing for us to carry through with this flashmob. Wes Veldink, Associate Choreographer of the Five Movements, for carrying the choreography torch here in NYC and contributing so amazingly to our rehearsals. The OA Fans group on Facebook for connecting so many of us. Ashley Williams, fellow OA Flashmob founder, for your random Facebook post that planted this seed. Eduardo Placer, fellow OA Flashmob founder, for talking me off the ledge of overwhelm and holding space for this to happen in the right time. Peter SennYuen for documenting the flashmob and sharing your OA love. Pastor Foster and St. John's Lutheran Church and Maya at Studio Maya for so lovingly donating your space for our flashmob rehearsals, and Maya for the tutorial video space. All the people who have learned the Five Movements and who are showing up - in person or in spirit - to shift into new dimensions with us.